A student skates at the Norris Ice Rink. 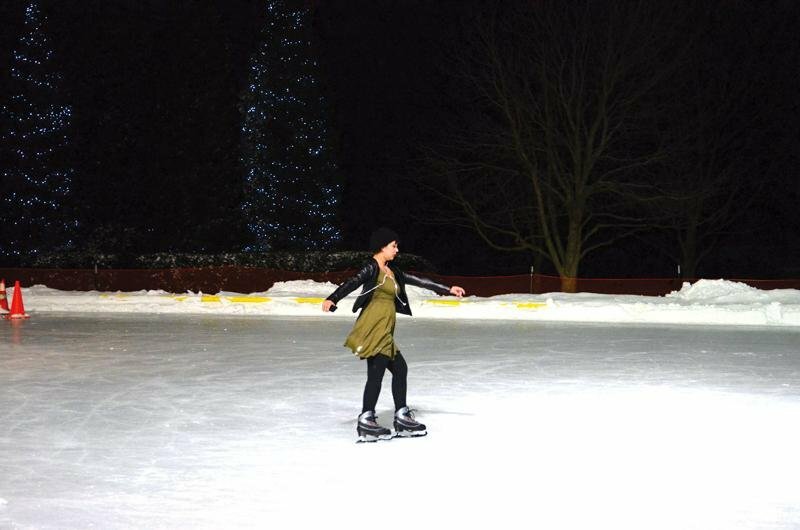 The ice rink opened for Winter Quarter on Jan. 9 and the cold winter weather has been friendly to skaters. The number of ice skate rentals at the Norris University Center has climbed this winter, aided by recent spells of cold weather. Norris Outdoors has loaned about 400 pairs of ice skates since it opened following Winter Break, supervisor Chandler Dutton said. The recreation office, located in the Norris basement, should continue to see strong sales if cold weather persists, said Debra Blade, assistant director of Norris Programs. Although students mostly stayed indoors the first few days back from break because of the polar vortex, they are beginning to take advantage of the rink, Blade said. This year, the rink opened earlier compared to last winter, when it was opened toward the end of January, Dutton said. Facilities Management normally opens the ice rink when Winter Break ends and removes it in February in preparation for Dance Marathon. “We are in better shape this year than past years,” said Weinberg junior Robert Walker, a Norris Outdoors supervisor. Following the installation of the ice rink in 2010, Norris Outdoors rented out 1,460 pairs of ice skates in Winter 2011. Frigid conditions and a blizzard which blanketed Evanston under more than two feet of snow led to good skater turnout that year. Norris Outdoors rented just 158 pairs of ice skates in Winter 2012 and 320 pairs last winter. When warmer weather closes the ice rink, some students rent ice skates to take to Millennium Park which uses refrigeration technology to cool its ice rink. This year, the ice rink at Wrigley Field is closed because of renovations being made to the ballpark. The cross country skis that Norris Outdoors loans are not as popular among students compared to the skates, Blade said. Mostly older faculty members or graduate students rent the equipment. Ice skate rentals spike during Fridays and on weekends, Blade said. Norris Outdoors currently has 64 pairs of ice skates in addition to snowshoes and skis in its winter sports inventory. The revenue collected from the rentals will be used to replace lost or broken equipment and buy new equipment. The organization is planning to purchase more tents in the spring. Most of the revenue Norris Outdoors generates comes from activities that take place outside the winter season, such as camping, Blade said. She described the organization as a “recharge area” that is self-sustainable on a small budget. Students dumped snow on each other and struggled to stay balanced in the ice rink on Saturday night. Yoseline Huerta, a first time ice skater, used a metal frame to keep from falling.